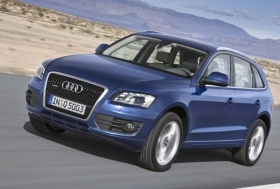 MUNICH -- Volkswagen's Audi and Seat brands are cutting production in response to the global downturn in new-car sales. Audi will stop vehicle production for five days in its main Ingolstadt, Germany, factory at the end of February, a spokeswoman said on Thursday. Audi produces the A3, A4 and A5 cars as well as the Q5 SUV and bodies for the Audi TT coupe in the plant. The production halt could also be extended to Audi's smaller Neckarsulm, Germany, plant, where the A6 and A8 models are assembled. VW's Spanish brand Seat plans to lay off 5,300 workers temporarily for some weeks between February and June this year. Workers sent home will get unemployment benefit from the regional government. Seat said it will extend the unemployment benefit so that the workers earn 80 percent of their regular incomes. Earlier this week, VW said it is putting two thirds of 92,000 employees in Germany on short-time working for five days in February.